QGIS allows users to define a global and project-wide CRS (coordinate reference system) for layers without a pre-defined CRS. It also allows the user to define custom coordinate reference systems and supports on-the-fly (OTF) projection of vector and raster layers. All of these features allow the user to display layers with different CRSs and have them overlay properly. QGIS tiene ayuda para aproximadamente 2 700 SRC conocidos. Las definiciones para cada SRC esta almacenada en una base de datos SQLite que esta instalada con QGIS. Normalmente, no se necesita manipular la base de datos directamente. De hecho, si lo hace podría provocar que la ayuda de la proyección falle. Los SRC personalizados estan almacenados en una base de datos de usuario. Consulte la sección Sistema de referencia de coordenadas personalizada para obtener información sobre la gestión de su sistema de referencia de coordenadas personalizada. Los SRC disponibles en QGIS se basan en los definidos por el European Petroleum Search Group (EPSG) y el Instituto Geográfico Nacional de Francia (IGNF) y se abstraen en gran parte de las tablas de referencia espaciales utilizados en GDAL. Los identificadores EPSG están presentes en la base de datos y se pueden utilizar para especificar un SRC en QGIS. In order to use OTF projection, either your data must contain information about its coordinate reference system or you will need to define a global, layer or project-wide CRS. For PostGIS layers, QGIS uses the spatial reference identifier that was specified when the layer was created. 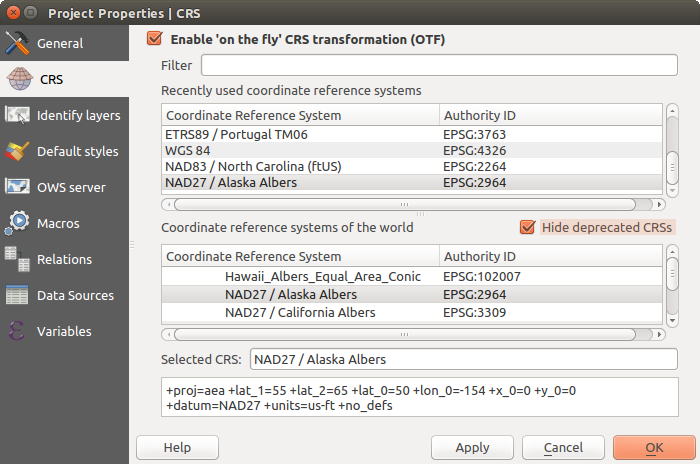 For data supported by OGR, QGIS relies on the presence of a recognized means of specifying the CRS. In the case of shapefiles, this means a file containing the well-known text (WKT) specification of the CRS. This projection file has the same base name as the shapefile and a .prj extension. For example, a shapefile named alaska.shp would have a corresponding projection file named alaska.prj. Whenever you select a new CRS, the layer units will automatically be changed in the General tab of the Project Properties dialog under the Project (or Settings) menu. QGIS starts each new project using the global default projection. The global default CRS is EPSG:4326 - WGS 84 (proj=longlat +ellps=WGS84 +datum=WGS84 +no_defs), and it comes predefined in QGIS. This default can be changed via the Select CRS button in the first section, which is used to define the default coordinate reference system for new projects, as shown in figure_projection_options. This choice will be saved for use in subsequent QGIS sessions. When you use layers that do not have a CRS, you need to define how QGIS responds to these layers. This can be done globally or project-wide in the CRS tab under Settings ‣ Options. If you want to define the coordinate reference system for a certain layer without CRS information, you can also do that in the General tab of the raster and vector properties dialog (see General Properties for rasters and General Properties for vectors). If your layer already has a CRS defined, it will be displayed as shown in General tab in vector layers properties dialog. Right-clicking on a layer in the Layers Panel (section Panel de capas) provides two CRS shortcuts. Set layer CRS takes you directly to the Coordinate Reference System Selector dialog (see figure_projection_project). Set project CRS from Layer redefines the project CRS using the layer’s CRS. 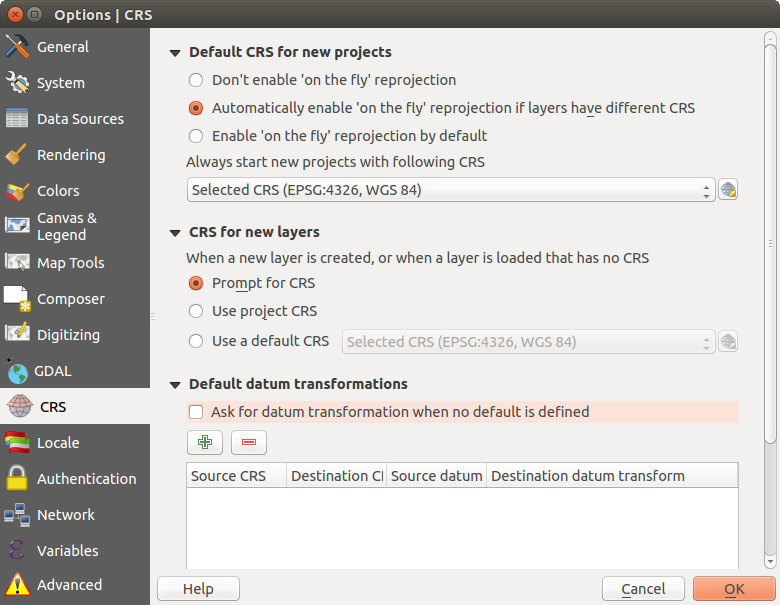 QGIS supports on the fly CRS transformation for both raster and vector data. However, OTF is not activated by default. When OTF is off, each layer is drawn using the coordinates as read from the data source. When OTF is on, each layer’s coordinates are transformed to the CRS of the project. Click on the CRS status icon in the lower right-hand corner of the status bar, leading you to the previous dialog. Turn OTF on by default in the CRS tab of the Settings ‣ Options dialog by selecting Enable ‘on the fly’ reprojection by default or Automatically enable ‘on the fly’ reprojection if layers have different CRS. If you have already loaded a layer and you want to enable OTF reprojection, the best practice is to open the CRS tab of the Project Properties dialog, activate the Enable ‘on the fly’ CRS transformation checkbox, and select a CRS. The CRS status icon will no longer be greyed out, and all layers will be OTF projected to the CRS shown next to the icon. Filter: If you know the EPSG code, the identifier, or the name for a coordinate reference system, you can use the search feature to find it. Enter the EPSG code, the identifier or the name. Recently used coordinate reference systems: If you have certain CRSs that you frequently use in your everyday GIS work, these will be displayed in this list. Click on one of these items to select the associated CRS. 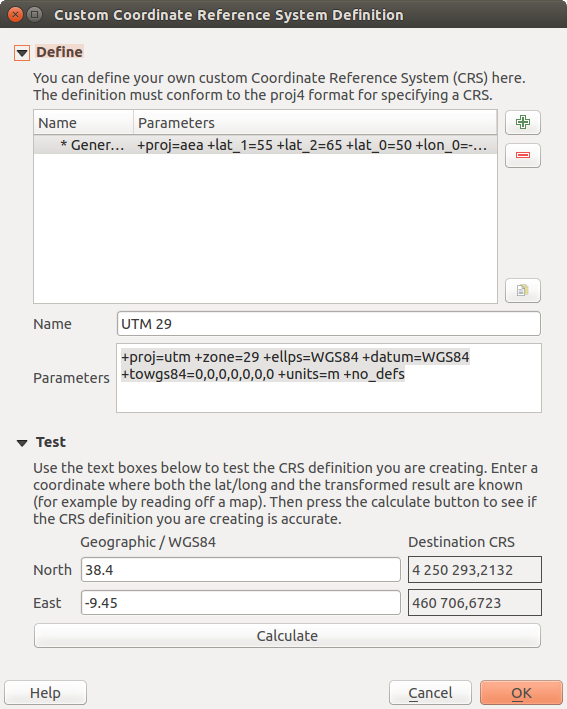 Coordinate reference systems of the world: This is a list of all CRSs supported by QGIS, including Geographic, Projected and Custom coordinate reference systems. To define a CRS, select it from the list by expanding the appropriate node and selecting the CRS. The active CRS is preselected. PROJ.4 text: This is the CRS string used by the PROJ.4 projection engine. This text is read-only and provided for informational purposes. Looking for a layer CRS? Use the CRS selector. Sometimes, you receive a layer and you don’t know its projection. Assuming that you have another layer with a valid crs that should overlaps with it, enable the OTF reprojection and, in the General tab of the Layer properties dialog, use the Coordinate Reference System selector to assign a projection. Your layer position is then moved accordingly. You may have to do some trial and error in order to find the right position, hence its original CRS. When operating across layers, for example, computing intersections between two layers, it is important that both layers have the same CRS. To change the projection of an existing layer, it is insufficient to simply change the CRS in that layer’s properties. Instead you must save the layer as a new layer, and choose the desired CRS for the new layer. Si QGIS no provee el sistema de referencia por coordenadas que necesita, puede definir un CRS predeterminado. Para definir un CRS, elegir Custom CRS... del menú Ajustes. CRSs personalizados se almacenan en su base de datos de usuario lqgl. A más del CRS personalizado, esta base de datos también contiene sus separadores espaciales y otros datos personalizados. Definir un CRS personalizado en QGIS requiere un buen entendimiento de la librería de proyección PROJ.4. Para comenzar, referir a “Procedimientos de Proyección Cartográfica para el Entorno UNIX - Un Manual de Usuario” por Gerald I Evenden, Reporte de Encuesta Geológica de Archivo Abierto U.S. 90-284, 1990 (disponible en ftp://ftp.remotesensing.org/proj/OF90-284.pdf). This manual describes the use of the proj.4 and related command line utilities. The cartographic parameters used with proj.4 are described in the user manual and are the same as those used by QGIS. To create a new CRS, click the Add new CRS button and enter a descriptive name and the CRS parameters. Note que :guilaber:`Parámetros` debe empezar con un bloque “+proj=”, para repersentar el nuevo sistema de referencia por coordenadas. You can test your CRS parameters to see if they give sane results. To do this, enter known WGS 84 latitude and longitude values in North and East fields, respectively. Click on [Calculate], and compare the results with the known values in your coordinate reference system. OTF depends on being able to transform data into a ‘default CRS’, and QGIS uses WGS84. For some CRS there are a number of transforms available. QGIS allows you to define the transformation used otherwise QGIS uses a default transformation. edit a list of user defaults for transformations. QGIS asks which transformation to use by opening a dialogue box displaying PROJ.4 text describing the source and destination transforms. Further information may be found by hovering over a transform. User defaults can be saved by selecting Remember selection.